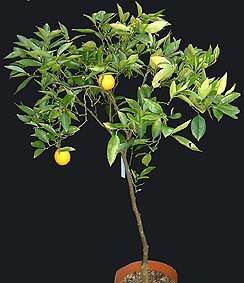 I find this one of the best varieties of all citrus for growing in pots in England. The fruits have a beautiful true lime aroma, delicious to add to your drinks. Problems of producing adequately sweet fruit in our cool climate do not arise here. 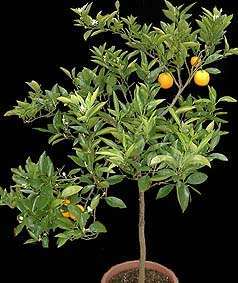 It fruits reliably every year on quite small plants. 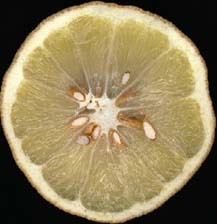 A typical lime, like the one shown here, is about 5cms long and always seedless. 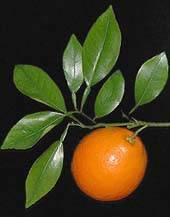 Also called Citrus Latifolia by Tanaka (see A Bit of Botany). Sometimes written as Bearss or Bears's. 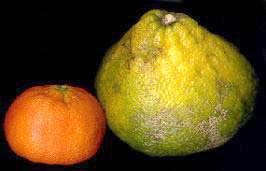 This series of pictures compares a tangelo grown here in England (left), with a shop-bought Jamaican Ugli tangelo (right).. They are 7cms and 12cms in diameter respectively. At first I couldn't believe that the two fruit in these pictures are the same variety, but close inspection has convinced me that the plant I bought as 'Ugli' is correctly named. Notice the raised and slightly furrowed stalk end and how the underside (middle picture) is depressed inwards on both. Finally see how both have the same number of segments and an open central core. 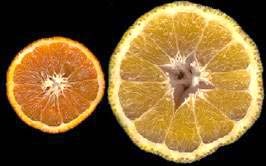 This shows how much differing climates affect citrus fruits. In the tropics fruit grow much larger but often stay green. In cooler areas a strong orange colour develops. Some reference books say that the Ugli variety is too acidic in non-tropical climates, but my fruit are quite acceptably sweet, but rather seedy. Overall, a good variety to grow in the UK, even though not particularly ugly here! This variety produces a very juicy fruit of deep orange colour internally and externally, often with a slight 'neck' at the stalk end. The fruit is richly flavoured, but needs to be left on the tree to sweeten adequately. The peel is soft, shiny and smooth. These pictures were taken at the end of January 2001. The cut fruit is 6.5cms across. 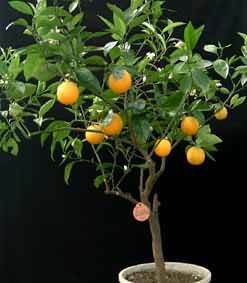 This page covers well-known types of citrus, but describes the particular named varieties that I'm growing here in England. This is an old English variety, sold by the now closed Rivers Nursery. It is a vigorous grower, and fruits well. However, the lemons produced lack that strong lemon tang. Cooking with them produces somewhat insipid results. 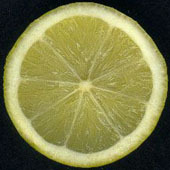 In Tintori's book, he says this variety is actually a lemon x grapefruit hybrid. Perhaps that explains the lack of strong lemon flavour. 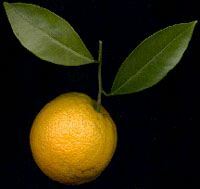 There are also varieties of orange, grapefruit and mandarin called Imperial. This is a non-navel 'sport' of Washington Navel. In some reference books it is said to produce especially good fruit in cool conditions, and this seems to be true for me. The plant shown, on a dwarfing rootstock, was imported from USA almost twenty years ago. 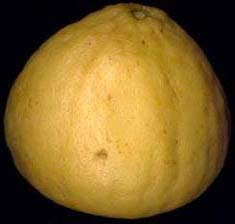 The fruit of this variety is less tangy than a true lemon, although some people say they prefer its sweeter taste. 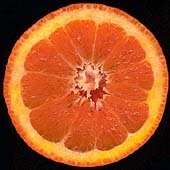 The colour of the ripe fruit clearly shows the orange in its parentage. Often grown from cuttings as it roots readily. The fruit is 4.5cms in diameter. 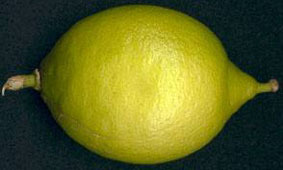 An extremely large lemon-like fruit. Also known as 'American Wonder Lemon'. A very large fruit, so much like the Ponderosa Lemon that I wonder if they are the same. Bought in the UK, I haven't found out much about this variety, but the name Padou could be a form of the Italian province of Padua. On the other hand it may be a mis-named Ponderosa. This fruit is 9cms in diameter. The fruit shown, picked April 2001 is 7cms in diameter. The peel is a little thicker than usual for this variety. These pictures were all taken in Summer 2002. 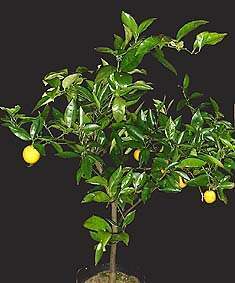 The potted trees are all about 1.5m or 4 feet tall and growing in 25cms (10") containers. Harward Late, or Harward Valencia, is a New Zealand variety. 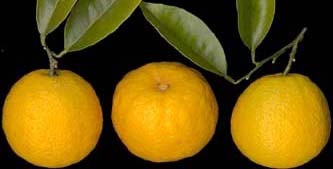 Maltaise de Tunisie, is a top quality commercial orange much grown in Tunisia. Silver is an old English variety from early orangeries. The cut fruit show some problems which frequently arise when attempting to grow in the UK. The Maltaise has a degree of granulation, probably from hanging too long on the tree. 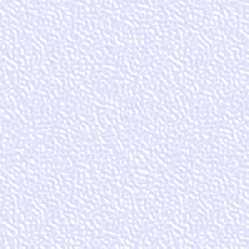 The Silver is rather thick skinned - a common problem in cool climates. The Harward Late was juicy but a little sharp. The Maltaise, with exceptionally soft peel, was sweet but a little on the dry side. The Silver was somewhat insipid in flavour.